It is Tulsidas Jayanti today, the birthday of saint and poet Goswami Tulsidas. Tulsidas was born during the month of Sravana, on the 7th lunar day (Saptami Tithi) of the waxing half of Moon cycle (Shukla Paksha). It falls on August 21 this year. Tulsidas was an ardent devotee of Lord Rama. At the time of his birth, he already had all his 32 teeth in place. He was born in lunar constellation of Moola Nakshatra. His family abandoned him considering it to be a bad omen. According to some astrologers, Moola Nakshatra is one of the set of nakshatras known as Ganda Moola that are considered inauspicious. But it is also believed that if a child born in one of these nakshatras survives first few years, he/she grows up to be very intelligent. Tulsidas was an incarnation of Sage Valmiki. 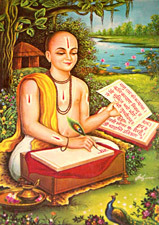 Valmiki composed the original Ramayana in Sanskrit. Tulsidas re-wrote Ramayana in Awadhi dialect of Hindi so that common people could understand. His version is known as the epic Ramacharitmanas. Tulsidas also gave us Hanuman Chalisa. Without Tulsidas, we would not be singing glories of Hanuman in this beautiful lyrical form. Surdas, a devotee of Krishna and a contemporary of Tulsidas, called Tulsidas as Sant Shiromani (the highest jewel among holy men). Abdur Rahim Khankhana, famous Muslim poet who was one of the Navaratnas (nine-gems) in the court of the Mughal emperor Akbar, was a personal friend of Tulsidas. Rahim composed the following verse describing the Ramcharitmanas of Tulsidas. The immaculate Ramcharitmanas is the breath of the life of saints. It is similar to the Vedas for the Hindus, and it is the Quran manifest for the Muslims. This entry was posted in Siva on August 21, 2015 by illuminatelifetoday.